Find all Puerto Vallarta related information to organize Your vacation in Puerto Vallarta, Jalisco, Mexicos most wanted beach destination. Have a look for the most interesting real estate companies. Look out to find the Puerto Vallarta hotel or Puerto Vallarta resort which fits Your needs. Puerto Vallarta offers a wide range of possibilities for travelers and expats as well. Through our sites we want to make the most important businesses and informational portals accessible. The friendliest travel destination in Mexico welcomes You ! Looking for something ? Just browse the categories ! Puerto Vallarta (P.V. ), the famous travel destination in Jalisco Mexico, is located at the centerpoint of the Banderas Bay in Mexico. With unparalleled natural beauty and gorgeous climate, this paradise offers a dizzying array of opportunities to create unforgettable travel experiences. Relax on sandy beaches with crystal clear water and listen to the surf, or choose from any number of water sports. Or take part in adventures, tours, activities and one of kind wildlife experiences offered by highly experienced companies and organizations. Explore the picturesque Old Town. Prowl the night clubs for music and dancing. Or have your dream wedding on the beach. Or come live in Puerto Vallarta! In addition to a rich cultural atmosphere, Puerto Vallarta offers all the necessary, as well as luxury, services and shopping opportunities to guarantee a perfect life. About 10.000 people from the US and Canada as well as other countries, make a home in Puerto Vallarta. Some stay year round, others seasonally. From Real Estate agencies to Rentals by owner, everything can be found if the traveler or resident knows where to look. This independent Puerto Vallarta Directory features a growing number of handselected Puerto Vallarta related internet sites, featuring all the necessary information to plan successful vacations, or to organize a perfect new home in and around P.V. 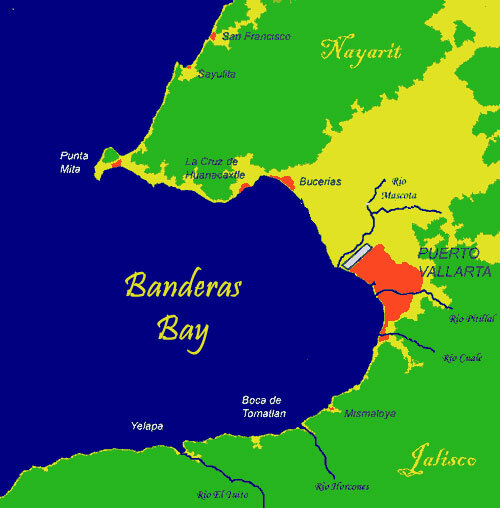 and the Banderas Bay. Come in and find what You are looking for! The Puerto Vallarta directory features about 400 selected Puerto Vallarta links for You. Yoga Vallarta - The nice and recommended Yoga Studio is located in the Romantic Zone of Puerto Vallarta. Offering classes like Power Flow, Hatha, Vinyasa Flow, Ashtanga, Kundalini, Yoga Basics, Gentle, Mat Pilates and Children's courses, Yoga Vallarta is open for everybody, beginners as well as professionals. Puerto Vallarta Whale Watching Forum - Participate in responsible whale watching in Puerto Vallarta, Mexico. We are a non-profit forum dedicated to educating consumers about the importance of responsible whale watching. Yoga, Massages, Reiki & SCIO - Sirius Body & Spirit offers you regular and privat yoga lessons. Our services include as well different alternative therapies like Reiki, Bach flowers and SCIO. Casa Caleta is a beautiful Mediterranean beachfront private luxury villa rental located in lower Conchas Chinas. One of the most exclusive Villas in Puerto Vallarta, this should surely be atop your list for group travel destinations in Mexico. Featuring 10,000 square feet, 6 bedrooms that sleep 12, and a full staff to pamper you unobtrusively. Only 5 minutes from town. Online Reservations available through the site. Coldwell Banker Previews International | Real Estate Puerto Vallarta. Global Brand, Local Charm. Guiding our friends and customers to the optimal choices in Puerto Vallarta Real Estate since 1984. Please have as well a look to our www.nayarit-directory.com where You can find many information and recommended websites for the state of Nayarit. Read about www.nuevo-vallarta.org or visit our new addition at www.mexico-facts.com providing an in depth view to all mexican localities with more than 500 inhabitants or visit www.nuestro-mexico.com to find all Travel destinations in Mexico.